From doublespeak in São Paulo and migrant caravans in El Salvador to a very British dystopia, catch up on the latest in world literature! We’re back this week with dispatches from three countries where literature and politics have been interacting in unexpected ways: Brazil, El Salvador, and the UK. In response to the election of Jair Bolsonaro, Central American migration to the US, and the Brexit negotiations, museums and literary communities in these countries have been producing thoughtful exhibitions, fiction, and criticism that reflect on national identity and uncertain political futures. It is hot and humid in Brazil, and long summer days provide opportunities for new authors and space for reflection about writing as political resistance. Early career authors have an opportunity to submit their work for the SESC Prize for Literature, which is open for submissions from January 9 through February 14, when unpublished authors can submit their manuscripts; the Record Publishing Group will release winning texts. “When I left El Salvador running, I didn’t know where I was heading, but I ran.” Despite the apparent simplicity of its prose, this passage encapsulates the author’s harried flight from his war-torn country in a moment where facing the complete unknown of exile was the best alternative to remaining in his homeland. In a particularly cruel twist, the country he is running from, El Salvador, translates into English as, “The Savior,” and the country the author eventually comes to, the United States, is responsible for fanning the flames of El Salvador’s Civil War (1980-1992) in an effort to win its own Cold War against the former Soviet Union. 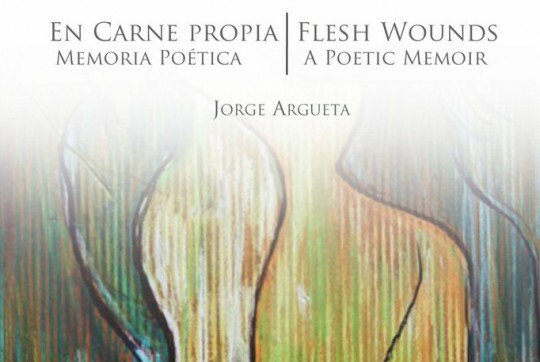 With this story of fleeing in the face of conflict at its core, Jorge Argueta’s brilliant En carne propia: Memoria poética/Flesh Wounds: A Poetic Memoir (Arte Público Press, 2017) emerges as a text that challenges straightforward narratives surrounding immigration to the United States from Latin America, and remains highly relevant despite taking place in the 80s. Those readers already familiar with Argueta’s work through his award winning children’s literature may be shocked to find the author’s personal history laid bare in a genre-bending poetry-prose narrative (in Spanish with an accompanying English translation) that does not shy away from his childhood environs “teeming with drunkards, prostitutes, servants, popsicle vendors, mechanics—the working class or the poorest of the poor” nor “an entire generation disappearing” during El Salvador’s Civil War. Those unfamiliar with Argueta’s previous publications or with contemporary Latinx literature in general will find themselves grappling with a text that at times appears both intimate and alienating as it guides the readers through the lasting consequences of a Central American Civil War that most Americans have long forgotten if they have heard of it at all.